A few days ago I was biking around the lake near my house. 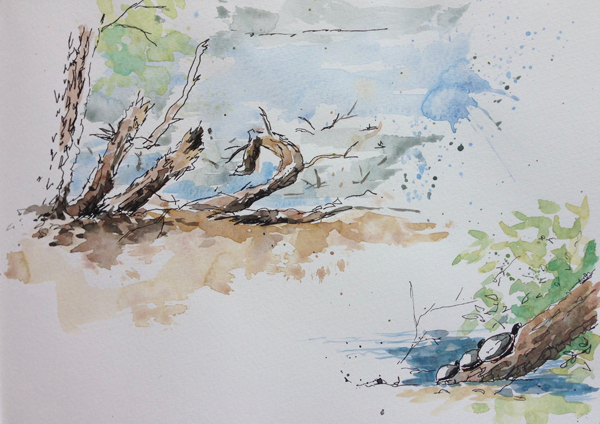 I found a grove of willow trees and decided to sketch the waterline. I parked my bike and found a spot among dead leaves, logs, and snail shells with the willow branches hanging down like a private curtain. I chose some logs and branches as my subjects and proceeded to sketch in pen. I kept my strokes loose. Around me I heard birds, a red squirrel chirping at me from its perch in the tree, tail batting back and forth, and sounds of bikers and kids on the trail a few feet away. Using Schminke watercolors and pen on a Moleskine watercolor sketchbook, I worked away under the warm breezes, happy for the shade. I noticed a log in the distance with three turtles sunning themselves. The contrast of lights and darks on their shells grabbed my attention. They were lined up so nicely and I’ve often seen turtles of various sizes on logs along this stretch of shoreline. I knew I had to add them to my sketch as well. It was a beautiful day for a sketch and a secluded beautiful place!